Door to door sales is a very noble profession. It can be incredibly hard work and for that reason it is important to work smart. However, the most skilful and experienced sales people don’t have to work as hard. They don’t need to knock as many doors to get the same results. Cutting Edge Door-to-Door Sales Tips teaches you a lot of valuable techniques that will help you to significantly improve your sales skills. The book increases your skill level and teaches you how to be a sales consultant instead of a salesman. It teaches you how to work smart instead of hard. You will learn advanced closing techniques, advanced objection handling and advanced N.L.P. techniques that have a proven track record, and much more. In any other form of sales, the skills and techniques that you will learn in this book will really come in handy as well. It is an absolute must read for anyone who wants to learn and progress and takes their sales career seriously. 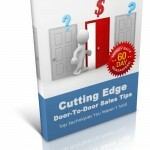 22 Sales gives Cutting Edge Door-to-Door Sales Tips a four star rating and because of that, we can offer this book at a BIG discount. Click here for more information about this book and to get your discount now. One Response to "Sales Books: Cutting Edge Door-to-Door Sales Tips"
Portland Custom Facebook Page, blog, online video, and email marketing first. If my leads generation programs slow down then its time to pound the pavement and go door to door.